One of the biggest watch-high-definition-movies-with-panasonic-tv-receiver/">High Definition Technology companies Panasonic Corporation has announced a professional 3D Full HD Production system. 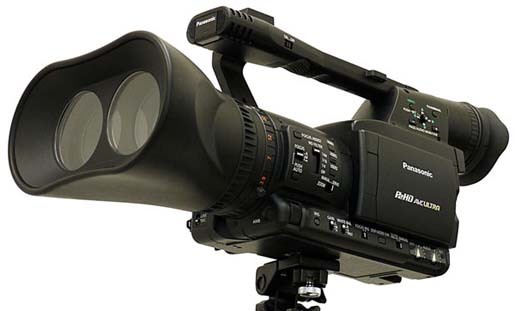 This device claims the handycam-tg5v-with-gps-from-sony-rocking-debutant/">first in the industry, consists of a twin-lens P2 professional camera recorder and a 3D Compatiblenew-camcorder-hits-the-american-market-hf11/"> High definition display. first-micro-four-thirds-camera-panasonic-introduces/">Panasonic has decided to exhibit the concept of 3D system at its booth on NAB 2009, which is going to be held in auto-eco-light-control-rushes-from-panasonic-twin-pa/">Las Vegas today. This interesting 3D camera from Panasonic based on the actual and suitingpanasonic-launches-waterproof-tvs-viera/"> P2 HPX170.